Medical transport of high-risk and critically ill newborns requires skilled personnel and specialized equipment. Ideally, a neonatal transport team forms a single component associated with a larger system of perinatal care composed of a tertiary care neonatal intensive care unit (NICU), a perinatal care unit, cadres of medical and surgical pediatric subspecialists, and a neonatal outreach program. 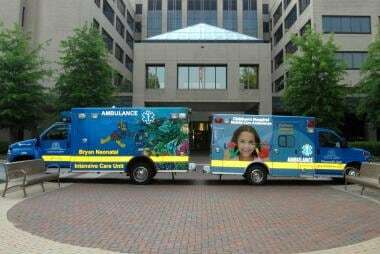 Vehicles for ground transport of pediatric and neonatal patients in the United States are usually truck chassis-based and either large enough to transport a single patient, similar in size to most ambulances (on the right), or larger units designed to transport several critically ill infants in transport incubators (on the left). Note that children's hospital units often may use custom, child-friendly designs. Note that despite the color schemes, the units must have mandatory safety features common to ambulances (eg, lights, lightbars, sirens, the "Star of Life," highly reflective stripes). A significant number of neonates require emergent transfer to a tertiary care center, often because of medical, surgical, or rapidly emerging postpartum problems. These are termed “outborn” neonates, because they have been born somewhere besides the facility to which they’ve been transferred. Because the outcome of an outborn neonate with major medical or surgical problems (including extreme prematurity) remains worse than for an inborn infant, primary emphasis should always remain on prenatal diagnosis and subsequent in-utero (ie, maternal) transfer whenever possible. Despite advanced training and technology, mothers usually make the best transport incubators. The emergence of skills to care for ill or premature newborns can be linked to exhibits of premature infant care at public expositions, such as the 1933 World's Fair in Chicago. These exhibits preceded the emergence of NICUs and the transport of ill infants. The next evolution in transport developed from the lessons in aeromedical transport of the wounded in World War II, Korea, and Vietnam. The need for rapid evacuation of trauma patients from the scene of accidents led to the development of a system of trauma centers and aeromedical transport services. In 1976, the Committee on Perinatal Health, sponsored by the March of Dimes, proposed a system for regionalized perinatal care and defined three levels of hospital care, which served throughout the 1970s and 1980s as a national model for the rapid development of neonatal referral centers. This model required the development of a neonatal transport system, which was associated with a significant reduction in the US neonatal mortality rate. The appearance of various commercial products for the care of neonatal patients in the transport environment paralleled the proliferation of neonatal transport programs. As health care financing becomes increasingly problematic, pressure increases to achieve efficiency. However, transport scheduling is an intrinsically unpredictable and inefficient process, especially for a low-volume/high-acuity specialty team such as that required for the neonatal population. A committed hospital administration should provide an experienced manager or program director for a transport service and encourage communication between the hospital administration, the transport team personnel, and the medical director. The on-call medical control physician is immediately available to provide advice before and during transport. The medical control physician has the appropriate knowledge to manage critically ill neonatal patients and must be familiar with the capabilities and procedures of the neonatal transport team. 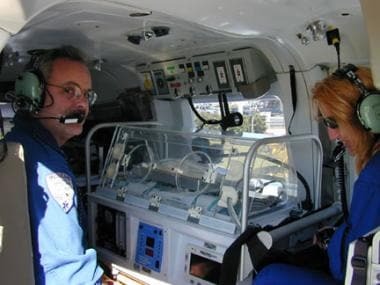 The neonatal transport team medical director, who should be a licensed physician and familiar with air and ground emergency medical services, supervises and evaluates the quality of medical care. Ideally, this physician is a board-certified subspecialist in neonatal/perinatal medicine, pediatric intensive care, or both. However, as an alternative, an adult-oriented medical director of a transport team may use subspecialty physicians as consultants. The medical director should be actively involved in (1) the selection of appropriate personnel, (2) continuing team education and training, (3) the development and review of policies, (4) the quality management program, and (5) the selection, orientation, and supervision of medical control physicians. To initiate the transport process, a mechanism is needed for immediately contacting the appropriate medical control physician upon receiving a transport request. The medical control physician decides whether transfer is appropriate, discusses stabilization issues with the referring physician, and, if indicated, authorizes or recommends a mode of transport. Additional communication occurs between referring physicians, accepting physicians, medical control physicians, transport team members, and pilots or drivers. Ideally, a dedicated communications center operates 24 hours a day, 7 days a week to allow for constant communication during the triage process and transport. A dedicated communications center is especially valuable for rotor-wing aircraft transport or for teams with multiple ground units. Several viable models are available for communications; to increase efficiency, the trend is to share resources via consolidated communications centers. An alternative method of initial contact is for the referring physicians to call the neonatal intensive care unit (NICU) directly and have the unit personnel place them in contact with the appropriate transport team medical control physician. This mechanism of routing communications is more commonly used by smaller centers and transport teams. Medical transport systems appropriately focus on rapid arrival of the transport team and medical direction of the team upon arrival at bedside. However, prior to the arrival of the transport team, medical direction and advice to the stabilizing personnel at the referring hospital may be invaluable. Upon being informed of a transfer request, the medical control physician is put in contact with the referring physician to discuss the case. Such discussion is essential to allow for adequate preparation of the accepting hospital and transport team and to provide direction on pretransport stabilization prior to the arrival of the transport team. Communication of vital signs, laboratory values, and previous therapies allows for effective comanagement of the patient. The Commission on Accreditation of Medical Transport Systems (CAMTS) develops standards that address patient care and safety in the transport environment and is an excellent resource for the transport industry. CAMTS strives to maintain accreditation standards in accordance with current medical research and transport industry developments and publishes these standards in order to define quality issues. The medical director is responsible for the development and supervision of transport protocols. The process involves the input of the medical control physicians, transport team personnel, and any applicable subspecialty services (eg, surgery, cardiology), who are encouraged to create a wide spectrum of protocols that cover the most common clinical scenarios encountered in this neonatal population, especially those requiring immediate recognition and action. Protocols usually include care guidelines for transport team configurations that require a physician. However, with the more common team configurations, the protocols may serve as standing orders to allow the transport team personnel to expedite the care of a critically ill neonate in the absence of direct physician input. The medical director should review protocols at least annually and distribute them to all medical personnel involved in the transport process. Most critically ill neonates who require transfer to a neonatal intensive care unit (NICU) have existing or impending respiratory failure, either as a primary diagnosis or secondary to their primary disease process. For this reason, transport teams commonly include respiratory therapists. The competence of resident physicians in airway management varies widely, depending on the level of experience of the resident and the skill level attained. Because competence in airway management must be dependable and consistent, this issue dictates the extent of resident participation in neonatal transport. Team competence in neonatal airway management is imperative. The team should be capable of (1) recognizing impending respiratory failure, (2) performing effective bag-valve-mask ventilation, (3) performing atraumatic intubation with appropriate endotracheal tubes, (4) instillation of artificial surfactant, and (4) management of ventilator settings. Nearly all ill neonates require peripheral or central intravascular access during transport. The team must have the necessary equipment and skills for routinely and reliably securing intravenous (IV) access in these tiny and challenging patients. Staff competency also ideally includes training in other unusual invasive procedures, such as percutaneous needle aspiration of the chest, chest tube insertion, umbilical catheter insertion, and intraosseous vascular access. Paramedics, nurses, respiratory therapists, nurse practitioners, and physicians have the role of rapidly stabilizing critically ill newborn patients for immediate transfer. The services of a specialized neonatal transport team have been shown to be associated with reductions in hypothermia and acidosis, as well as with reduced mortality in low ̶ birth-weight infants. A number of transport team configurations are used for neonatal transport. Traditionally, adult advanced life support (ALS) ground transport units are staffed by an emergency medical technician (EMT) and a paramedic (EMT-P), using the military transport configuration. Critical care transport teams are commonly configured with an experienced registered nurse (RN) working with another nurse, a paramedic, a respiratory therapist, or a physician. The most common crew configuration is an RN and EMT-P. The 2-RN configuration is the second most common. However, in many pediatric/neonatal transport programs, a respiratory therapist (RT) is the second crew member, because of airway management expertise. Each kind of specialist, however, has advantages and disadvantages. These attributes, in reference to neonatal transport, are listed in Table 1, below. Versatility in this context refers to neonatal infant care only. Obviously, paramedics would have a high degree of versatility and experience when generalizing to adult care scenarios. Within a perinatal system, the transport team should be regarded as serving several other functions, including on-site teaching, communicating strengths and weaknesses of the referral hospital to the outreach personnel at the tertiary center, and public relations. The data in the table below are used to determine crew configuration for a neonatal transport team. These relative scales are only generalizations. Team configuration is determined largely by local availability of personnel, patient characteristics, and tradition. Little published data is available on these issues to assist in the decision process. Applicants should be informed of any mandatory outreach educational roles and expectations, as well as any public relations aspects of the job. Potential team members must be informed of the precise job requirements, especially if additional training, such as EMT or paramedic certification, is required. Additionally, due to requirements of aeromedical transport, personnel may have rigorous physical fitness and/or strength requirements and body weight limits. Continuing education, which includes practice labs, should be undergone at least annually. Because some skills are rarely used in the field, maintaining competence is essential. Schedule a structured series of skill sessions to ensure competency. Sessions may occur in the clinical realm (ie, NICUs, delivery room suites, or operating room suites) or in practice labs with models, animals, or cadaveric material. Often, the critically ill neonatal patient cannot be adequately stabilized and managed in an outlying referring hospital, leading to time pressures in arranging for transport team arrival. One possible alternative to long delays and increasing costs is to use seasoned, cross-trained personnel, including cross-trained NICU personnel, to perform transports. The feasibility of this alternative is dependent on adequate planning and training and a carefully defined triage mechanism. Because personnel cross-training necessitates more training, demands should be carefully evaluated. 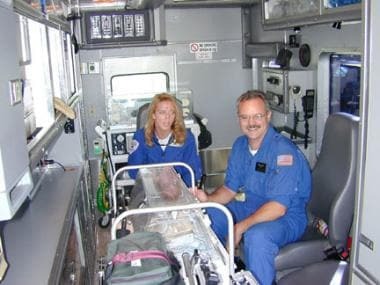 Interior of an ambulance configured for neonatal ground transport. Two incubators are loaded; the transport incubator is in the foreground, and a second incubator is in the background. Two crew members are on board. Note the excellent patient access and equipment availability. 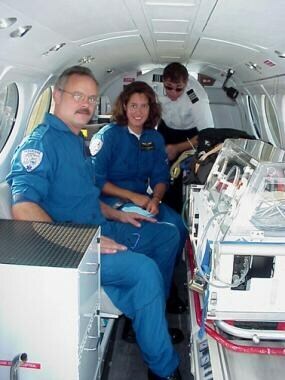 Interior of a rotor-wing aircraft (helicopter) configured for neonatal transport. A flight incubator and 2 crew members are on board. The aircraft is an MBB (Messerschmidt-Bolkow Blohn) Model BK-117A4 manufactured by American Eurocopter (Grand Prairie, Texas), reconfigured and operated by Omniflight (Dallas, Texas). Note the limited access to the incubator and equipment that highly restricts crew movements. Interior of a fixed-wing aircraft configured for neonatal transport. A flight incubator and 2 crew members are on board. The aircraft is a King Air Model 200 (Raytheon-Beech Aircraft, Witchita, Kansas). Note that interior space is adequate. The transport team assumes patient care and rapidly loads the neonatal patient for transport, thereby reducing out-of-hospital time and maximizing access to neonatal intensive care unit (NICU) management. For neonates with rapidly progressing disease processes, this reduces the potential for progression of the disease prior to arrival. Method 1 is more often used with less-experienced team personnel, with rotor-wing transfer, or both. This approach leads to shorter out-of-hospital intervals. The addition of several low-level interventions, such as peripheral intravenous insertion, nasogastric tube insertion, oxygen administration, or Foley catheter insertion, does not generally add significant delay to the time of stabilization. This transport model is similar to the model typically used in trauma calls, affectionately known as "swoop and scoop." Each neonatal patient undergoes a careful assessment (eg, vital signs), a rapid blood glucose determination, and establishment of IV access. Because respiratory distress is such a frequent problem with a large proportion of critically ill neonates, special effort should be paid to assessing the airway and the competence of oxygenation and ventilation. Following this initial, rapid assessment, most neonates who are not stable or are deteriorating rapidly are stabilized quickly and then expediently transferred. Alternatively, some clinical situations require more extensive and immediate interventions in the field, including artificial surfactant administration for extreme respiratory failure, and evacuation of a pneumothorax, among others. The critically ill neonate often may be an extremely premature infant who may have a birth weight of less than 1 kg and markedly immature skin that is prone to massive insensible fluid losses. The low fat stores render this patient vulnerable to hypothermia. In the neonatal intensive care unit (NICU), infants are managed with specially designed neonatal radiant warmers or incubators, which decrease and/or compensate for these fluid and heat losses. During transport, thermal control becomes very difficult due to environmental conditions, which may include cold weather, high winds, high elevations, travel over a long period of time, and less-efficient equipment. Polyethylene bags or sheets placed over the infant may help to maintain body temperature during resuscitation and/or transport of VLBW infants. A hypothermic neonate should be rewarmed in a highly controlled fashion (approximately 1°C/h), which is extremely difficult to accomplish during transport. Rapid rewarming of hypothermic neonates is associated with increased mortality and increased severe morbidities. Because therapeutic hypothermia needs to be instituted within 6 hours of delivery (and preferably earlier) to be effective, therapeutic hypothermia ideally is effectively and safely instituted at the referring institution or upon arrival of the transport team. However, retrospective data has emerged documenting the effectiveness of hypothermia initiation outside of the referral center NICU. One article documented the effectiveness of the experience of a single center in preadmission induction of therapeutic hypothermia and found that caution is indicated in active cooling. Hypothermia was initiated by the referring institution by passive cooling in 35 of 40 neonatal patients transported for HIE. Of those patients, 23 required additional active cooling by the transport team. Of the actively cooled infants, 5 had core temperatures of less than 30ºC; thus, caution is indicated. No clinical data have documented the effectiveness of these techniques in eventual neurodevelopmental outcomes. In patients who require positive pressure ventilatory assistance, the first level of intervention is bag-valve-mask ventilation, although it is unacceptable for prolonged airway management during transport. Intubation in the neonate requires an uncuffed endotracheal tube of appropriate size, varying from 2.5-4 French external diameter. The neonatal transport team must know how to perform rapid, atraumatic intubation, with subsequent tube positioning and security. Positive pressure ventilation can be accomplished by hand-bag ventilation for transports of short duration, but transport ventilators are generally used for most transports. Transport ventilators are often different from those models used in the receiving NICU; therefore, the transport personnel must be experienced in the setup and use of these ventilators. Due to limitations in current technology, transport ventilators are not currently capable of patient synchronization, patient-triggered ventilation modes, heated ventilation circuits, or high-frequency ventilation modes. Routine NICU care involves patient monitoring with cardiorespiratory monitors that use adhesive chest leads and pulse oximetry monitors that use pulse-detecting extremity probes. Continuous monitoring of blood pressure requires the use of transducers that are in line with indwelling central lines (e.g., umbilical catheters). The increased vibration and electromechanical interference associated with the transport environment frequently interferes with or precludes such monitoring. The premature neonate's small size and small signals complicate electronic interference issues. These interference problems are greatest during aircraft takeoff and landing. At these times, the crew may be distracted by required flight protocols, are restrained for safety reasons, and may be unable to accurately assess the patient. The highest probability of monitoring failure, therefore, occurs during the periods when the patient is most likely to become destabilized and require intervention. Increasing altitude affects physiology in a number of ways; this includes causing decreased partial pressure of gasses, expansion of trapped gas compartments (e.g., pneumothorax), lowered environmental temperatures, and altered drug metabolism. Flight crew members and medical control physicians must be familiar with these concepts. Flight team personnel are also affected by the transport environment and need to be familiar with how their own performances are altered. For example, if a flight team member with a head cold and upper airway congestion experiences a sinus squeeze upon takeoff, they need to recognize and deal with this phenomenon quickly so that patient care and team safety are not compromised. With respect to pharmacologic issues, neonatal patients are not simply scaled-down adults. One historical example of this is the use of the drug chloramphenicol, which, if given to an infant in a dose that is simply proportional to the infant's smaller size, causes shock and possibly death from gray baby syndrome. In this example, the discrepancy in drug metabolism is due to decreased and altered hepatic elimination. For hepatically eliminated drugs, the neonate may have either a reduced or absent capacity for certain enzymatic degradation pathways. Thus, a drug that is metabolized by one enzymatic pathway in adults (e.g., glucuronidation) may be metabolized in infants via a completely different pathway (e.g., sulfation); this can result in unpredictable drug metabolism. The enzymatic processes progressively develop in the fetal liver, with more complex enzymatic processes requiring more gestational development (ontogeny of development). One should use caution when administering drugs excreted by the kidney, because the neonate, especially the premature and/or critically ill infant, initially has a decreased glomerular filtration rate and generally has decreased renal function. Prolonged dosing intervals are often used for medications with renal excretion, and serum drug levels are often required. In addition to patient care issues, a quality management program assesses all other aspects of the transport program as well. This includes continuous monitoring and assessment of communications, initial and continuing education, maintenance of required licensure and certifications, ambulance and aircraft maintenance, and operational issues, especially safety. Quality management should be deeply imbedded into the program by beginning with a program scope-of-care and mission statement. Hospital administration should guide the process with the involvement of the transport staff and the medical director. Transport programs should have established patient care guidelines that are reviewed on an annual basis by the staff, management, and medical director. There should be prospective agreement on the applicable quality indicators. Industry guidelines for standards of operation and standards of care, such as those issued by the Association of Air Medical Services (AAMS)  and the Commission on Accreditation of Medical Transport Systems (CAMTS),  are available and should be used. For many other issues, however, the team should decide on the indicators (objective measures that are prospectively delineated and collected for analysis) and thresholds (statistical measure of compliance on the specific indicator) for acceptable outcome or compliance. Thresholds must be attainable, realistic goals for assessing compliance and quantifying improvement. An annual review needs to be made of the quality assurance process itself. Involving the staff in a peer review process increases the success of a quality assurance program. Data collection provides important information that is used in previously described quality assurance functions. The transport team often takes on the task of data collection so that it functions as a component of a larger system of perinatal care. Transport data are monitored to provide hospital- or physician-specific topics for review by perinatal outreach programs. Referring practitioners are interested in hearing discussions on issues they perceive to be timely. Discussing recent cases and situations in their institutions is effective in outreach and continuing education efforts. Data collection increases the efficiency of a transport service. Monitoring the hour of transport requests, length of transport time, length of time at bedside, incidence of delayed calls, and incidence of overtime is useful in altering schedules or timing of elective reverse transports. The triage of personnel for a reverse transport is generally easier because the infant is more stable and the medical condition is known. This allows the transport team configuration to be matched to the infant's medical needs. For example, if the infant has stable respiratory status (ie, no oxygen requirement), then the presence of a physician or respiratory therapist is less important. These considerations reduce costs and maintain the availability of the primary team for incoming calls. Butterfield LJ. Historical perspectives of neonatal transport. Pediatr Clin North Am. 1993 Apr. 40(2):221-39. [Medline]. March of Dimes Birth Defect Foundation. Toward Improving the Outcome of Pregnancy: The 90's and Beyond. 1993. AAP Committee on Fetus and Newborn & ACOG Committee on Obstetric Practice. Interhospital Care of the Perinatal Patient. CJ Lockwood, JA Lemons. Guidelines for Perinatal Care. 5th ed. Elk Grove Village, IL: American Academy of Pediatrics; 2002. 57-71. Commission on Accreditation of Medical Transport Systems (CAMTS). 1999 Accreditation Standards. 4th ed. 1999. Karlsson BM, Lindkvist M, Lindkvist M, et al. Sound and vibration: effects on infants' heart rate and heart rate variability during neonatal transport. Acta Paediatr. 2012 Feb. 101(2):148-54. [Medline]. Harrison C, McKechnie L. How comfortable is neonatal transport?. Acta Paediatr. 2012 Feb. 101(2):143-7. [Medline]. Watson A, Saville B, Lu Z, et al. It is not the ride: inter-hospital transport is not an independent risk factor for intraventricular hemorrhage among very low birth weight infants. J Perinatol. 2013 May. 33(5):366-70. [Medline]. Palmer KG, Kronsberg SS, Barton BA, Hobbs CA, Hall RW and Anand KJ. Effect of inborn versus outborn delivery on clinical outcomes in ventilated preterm neonates: secondary results from the NEOPAIN trial. J Perinatol. April 2005. 25(4):270-275. [Medline]. Chen P, Macnab AJ, Sun C. Effect of transport team interventions on stabilization time in neonatal and pediatric interfacility transports. Air Med J. 2005 Nov-Dec. 24(6):244-7. [Medline]. Shankaran S, Laptook AR, Ehrenkranz RA, Tyson JE, McDonald SA, Donovan EF. Whole-body hypothermia for neonates with hypoxic-ischemic encephalopathy. N Engl J Med. 2005 Oct 13. 353(15):1574-84. [Medline]. Jacobs SE, Morley CJ, Inder TE, et al. Whole-Body Hypothermia for Term and Near-Term Newborns With Hypoxic-Ischemic Encephalopathy: A Randomized Controlled Trial. Arch Pediatr Adolesc Med. 2011 Aug. 165(8):692-700. [Medline]. Association of Air Medical Services (AAMS). Pediatric, Neonatal, and Maternal Patient Care: Addendum to the AAMS/NFNA Resource Document for Air Medical Quality Assurance Programs. 1990. Yao S, White H, Dow K, Kronin C, Lee S. Transport Outcomes of Very Low Birth Weight Infants Among Canadian NICUs. American Pediatric Society/Society for Pediatric Research. May. [Full Text]. Gould JB, Danielsen BH, Bollman L, et al. Estimating the quality of neonatal transport in California. J Perinatol. 2013 Dec. 33(12):964-70. [Medline]. [Guideline] Section on Transport Medicine, American Academy of Pediatrics. Transport Physiology and Stresses of Transport. Woodward GA, Insoft RM, Kleinman ME, eds. Guidelines for Air and Ground Transport of Neonatal and Pediatric Patients. 3rd ed. Elk Grove Village, IL: American Academy of Pediatrics; 2007. 197-217. Disclosure: Receive salary from Pediatrix Medical Group of SC for employment. for: Mednax.